In this stylish twist on classic Italian pesto, I use peanuts instead of pine nuts, peanut oil instead of olive oil, and three herbs — cilantro, mint, and Thai basil — in place of Italian basil. I've made it with different herbs, depending on what I had on hand (once I even added marjoram to supplement a short supply of basil), and it's always good: fresh, rich, and aromatic. 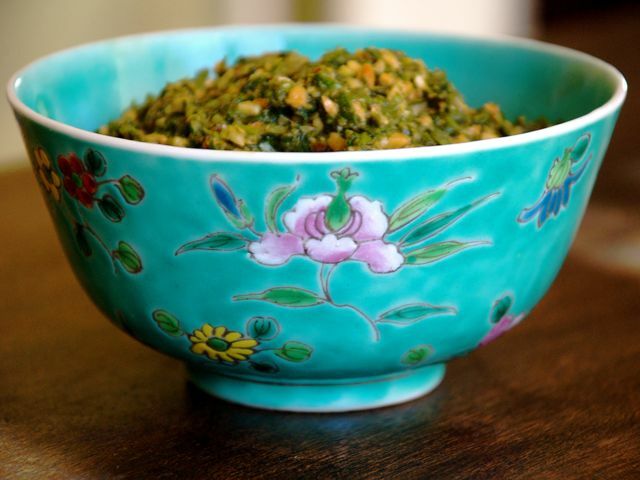 Thai basil gives this dish the right flavor, so make an extra effort to get some. If you can't find it, however, regular basil will do. Italian pesto uses Parmesan cheese to intensify the savoriness; this recipe uses only salt, so make sure you use enough or the flavor of the herbs will be lost. Roast the peanuts in a 350-degree oven or toaster oven until golden brown, 10 to 15 minutes. Grind the garlic in a food processor or blender until it is finely minced. Add the peanuts and process again until the peanuts are chopped into very small pieces; don't let them turn into a paste. Transfer the mixture to a large bowl. Process the herbs in small batches until finely minced (reserve a few sprigs for garnish). Add them to the bowl. Stir in the 1 tsp. salt, lemon juice, oil, and chile sauce. Make sure everything is well combined. Add a bit more oil if necessary. The pesto should be loose but not excessively oily. Let the pesto rest for 15 minutes, then taste to see if it needs more salt (I find that it usually needs a heaping teaspoon total). Bring a large pot of water to a boil and cook the noodles, loosening the bundles with tongs, until just done, 5 to 8 minutes. Drain and rinse with cold water. Add the noodles to the sauce in the bowl and toss thoroughly with tongs. Do this just before serving for the freshest taste. Transfer the noodles to a large serving bowl. Garnish with lemon wedges and a few sprigs of herbs. This sauce can be made in advance and stored in the refrigerator for several days. The color will change from bright to dull green but the flavor will hold.